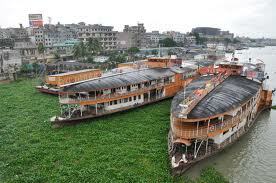 Located on the banks of the River Buriganga, the city has a population of about 7 million, making it one of the largest cities in the region. It has a colourful history and known as the 'City of Mosques.' Modern Dhaka is the center of political, cultural and economic life in Bangladesh. Hazrat Shahjalal International Airport, formerly known as Zia International Airport, is the gateway to Dhaka for most international travellers. As the largest airport in Bangladesh, it is a hub for all four of the nation's major airlines and handles roughly six million passengers each year. More than 30 airlines offer flights to and from the airport's three main terminals, including Bangkok Airways, Biman Bangladesh Airlines (which runs a service from Heathrow), Emirates and Gulf Air. Shahjalal airport is located about 11 miles from central Dhaka, which lies to the south. Situated on the banks of the Buriganga River, Dhaka is a bustling and vibrant metropolis with an estimated population of 15 million. It covers an area of 360 square kilometres and is known as the City of Mosques, due to its many places of worship. Dhaka is classed as a 'mega city' and is one of the world's fastest growing urban areas, with the UN having predicted it could be home to more than 20 million people by 2025. The city dates back to the 7th century and became an important part of the Mughal Empire in the 1600s, when it was known as Jahangir Nagar. However, much of the metropolis as it stands today was developed under British rule during the 19th century, before Dhaka became the administrative centre of East Pakistan and then capital of the newly independent Bangladesh. Its streets witnessed major turmoil following the partition of India in 1947, when a large proportion of the Hindu population left for India and the city received an influx of Muslims. The Liberation War Museum offers a compelling account of the city's recent past and is a must-see for people looking to find out more about Dhaka. Lalbagh Fort is an unfinished Mughal palace in the southern part of the city. This historic site witnessed the native soldiers' first battle for independence against British forces in 1857. The National Assembly of Bangladesh, known as Jatiyo Sangsad Bhaban, is located in the heart of the capital. Created by celebrated US architect Louis Kahn, it is one of the world's largest legislative buildings. Baldha Garden offers a tranquil spot where visitors can collect their thoughts amid the hustle and bustle of the city. Spread over more than three acres of land, it was created in 1909 and is one of the oldest botanical gardens in Bangladesh. 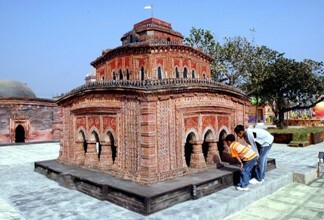 Sonargaon, the ancient capital of Bengal, is situated about 29 km outside Dhaka and is well worth a day trip for those with an interest in history and archaeology. Buying food from street vendors is generally not recommended in Dhaka, as hygiene standards can leave something to be desired. Instead, try one of the many restaurants hidden among the city's narrow alleyways, which offer cheap but delicious meals. The rainy season last from May to September in Dhaka, so travellers looking to avoid precipitation are advised to visit during the early or latter stages of the year. Temperatures in the city can reach up to 35 degrees C in April, which is generally the hottest month. Strong winds and violent thunderstorms are common during the early summer and late monsoon season.